Poltergeist is one of those movies that evokes mixed emotions. Sure, it was one of the really scary ones when it just came out, and the rumors of a curse after the tragic early death of Heather O’Rourke probably added to the mystique. I actually didn’t see the movie until over a decade had passed since its release. It came out when I was in college, and I didn’t often splurge to see a movie in those days. VCRs were still expensive and your only real option was to rent a movie. In any case, a few years back I bought a cheap DVD and, after having seen many horror movies, it felt a little tame. And the ending was over-the-top. I have a theory that being unemployed makes you vulnerable to suggestion. Over the weekend I was looking for a movie I could watch for free on Amazon Prime, when Poltergeist II showed up. I hadn’t even realized that there had been a sequel, and after watching it, I think I understand why the movie was buried. 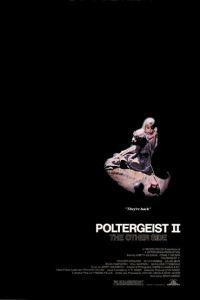 Poltergeist II: The Other Side picks up where the original left off. An added character, Taylor, a Native American shaman, brings good spirits to the Freeling family as the original poltergeists start to haunt Diane’s mother’s house, where they are staying. Interestingly, the ghosts are revealed to be those of a traveling, apocalyptic preacher and his followers. The preacher, Henry Kane, led his group to the desert where they awaited the end of the world and then died after it did not come. They were apparently the ghosts haunting the original Freeling house, and not those of the “Indian burial ground” that the first movie touted. Taylor brings the healing, Native American spirits into the conflict and they win out over the Christian sect ghosts. All of this was becoming more unbelievably campy until Carol Anne was rescued by her now deceased grandmother, in the form of an angel. This mythological cocktail left me feeling a bit dizzy. Some interesting subtexts floated through this film. Native Americans were now good, rather than the haunting spirits of the first movie. Kane’s sect, which had to be a veiled reference to the Latter Day Saints, showed Christian millennialists as the truly dangerous otherworldly residents. Kane is a preacher (and Mezcal worm) that doesn’t really want to pass over into the light. Why he travels all the way to Phoenix to try to pick up a nine-year-old girl isn’t really clearly explained. Horror movies, of course, frequently make use of religion as a vehicle for what truly frightens. Often it is religion misunderstood. Kane was not a believable character, in this case, without the abject cynicism of an unholy ghost who traveled to the desert southwest to set up a new religion. Once Mormonism breaks into the mainstream, perhaps I’ll have the stomach to watch Poltergeist III and see where the evil shifts the next time.